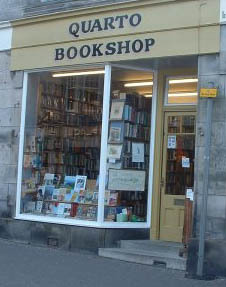 It was a mistake to Google ‘Quarto Bookshop’, since it led me to a chain of discussions on student life in St Andrews between 2002 and 2003. Among the comments was ‘Went down to the Quarto and climbed their ladder – these people have no concept of risk assessment.’ In fact I do. That was the year I climbed and abseiled off the Inaccessible Pinnacle, so my general risk assessment is to look up when someone goes towards the ladder and to think ‘She looks forty-five years younger than me, I can do it, therefore she can!’ This may be foolhardy, but no one has fallen off it yet. Another on-line student reported the fact that I bought most texts at 40% ‘But she didn’t want one, and told me it had gone off the reading list, which I suspect is old-lady-speak for ‘we’ve already got a million”. On the contrary, mundanely enough, it is ‘old-lady-speak’ for ‘it has gone off the reading list’. We old ladies are less capable of dissembling than your average student, who still has to worry if ‘See you around!’ means ‘He’s stopped loving me!’ or ‘Interesting point!’ means ‘She’s heard it all before.’ We old ladies spend a lot of time with grandchildren under the age of five, who are brutally frank, so we get used to telling it how it is. The online chat had discontinued – just as well, as I might have been tempted to join in. During 2002-3 I could still persuade myself that the downturn in 2001 was the post Open Championship downturn. But the steady decline in my fortunes since then has other causes. 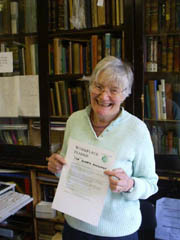 In 2003 or thereabouts Barnados opened a dedicated bookshop in St Andrews. They do not have antiquarian or new golf books, and they do not do student texts, but much of my business is in the simple secondhand book between £2 and £10. When customers find out that they no longer have to leave the town centre to get such books, quite sensibly they buy those books there. Who can blame them, and who can blame Barnados? There are children out there that need the money more than I do. It is difficult to compete with a charity that gets its staff and books free, and only has to pay a small proportion of Council Tax and the precipitous plunge in takings made me gloomy. Amazon also exacted its toll. It does not sell specialised golf books cheaper than I do, but the foreign customer would sometimes rather browse my shelves and copy out the ISBN than carry the heavy books home. Short of cutting off their hands, I cannot stop them. The secondhand web sites mean customers can find something they know that want without stirring from their terminals, leaving the Quarto with the casual browser. Then there is St Andrews University: with the honourable exception of the English Department, students never find out what they need to read until just before the new semester. Even when I think I have absolute guarantees from a lecturer that he will set the same text next year as this year, he can change his mind in the middle of the summer. Sure that I will sell A, B and C, I later find that students need A and D, leaving me with piles of B and C and no customers. In past years this hasn’t mattered, a few alterations here and there make no difference, but Universities are now assessed on the quality of their teaching and staff are constantly fishing for Brownie Points by upgrading their reading lists in the sure knowledge that no one is going to listen to their lectures to see if they too have been revised. If this happens in several subjects at once, I can be in trouble. Books themselves will soon become redundant since students are charged for course packs by their tutors: a bit of this book, that article and another chapter from somewhere else and why buy a book, half of which will go unread? The new University Librarian tells me that some Course Co-ordinators even boast that their students don’t need books any more. Since I reached retirement age several years ago, I decided that the time had come to quit. Our lawyers looked at our site in Golf Place and told us that someone would give an arm and a leg for it. I have only been giving about half an arm in terms of payment to my former business partner who still owns half the building. She has been subsidising the continued existence of the Quarto out of sentimentality all these years and we should rectify the matter. An attempt to keep the site as a bookshop failed, after months of negotiation, when a possible purchaser of the lease would only sign a lease that allowed him to sell anything he wanted. So we are contemplating what to do next. My closing down sale was meant to be over by now, and I have lost half a stone pushing out my three advertising bikes every morning and retrieving them at night. Posters have varied from ‘You don’t need a mountain bike to get to the Quarto Closing Sale’ with a picture of Ben Nevis inserted between Tesco and Quarto, to ‘This bike made it from Lands End to John O’Groats: Surely You Can Make it to the Quarto Bookshop Final Sale.’ Like its owner, my lovely Dawes touring bike is rather the worse for wear, and unlike its owner has had several transplants in the form of new wheels, neither of us could repeat the trip. At present the slogan is ‘From Tesco to Quarto, one small step for man, one giant leap for bargain hunters.’ Even if the posters didn’t shift a single extra book, they gave me some entertainment. The Quarto itself has given me thirty-seven years of amusement and enjoyment, which I haven’t sufficiently emphasised in these columns. A particularly irritating customer would see me rushing to the keyboard to ease my frustrations by sharing them with the readers of Scottish Book Collector, while the charming, knowledgeable, book loving customers would be taken for granted as would be my amazingly well-read and capable staff. So if you number yourselves among the customers who gave a lift to my day, and sent me back home with a new bit of out-of-the way information to share with my husband, thank you. If you were simply the unobtrusive one who always smiled and said ‘good bye’ even if you had found nothing to your taste, thank you too. It’s been a pleasure doing business. We still have some good antiquarian books at half price, most of the secondhand stock has been reduced to £1 and there is 33 per cent off new books. So email or phone 01334 474616 to see if we’re still open, and come along to the final final sale. My retirement ploy, since I completed the Munros at last, is to climb the Corbetts. So if I don’t meet you on a summit somewhere, I’d like to say ‘Goodbye’ (old-lady speak for ‘Goodbye’) and happy browsing.